Manufacturing assembly lines can expose workers to risk of repetitive motion injuries. The statistics about work-related injury costs in the U.S. are astonishing. OSHA says they cost companies up to $50 billion per year in direct costs related to workers’ compensation. Using an accurate and validated tool for predicting physical human behavior enables manufacturers to protect budgets and avoid the trial-and-error approach to task and process development. With more than a decade of research and development for the U.S. Department of Defense and private industry, SantosHuman is the most accurate and autonomous digital human model available today. Santos technologies allow manufacturers to see potential flaws in their processes and focus on task-based, human-centric design. Our predictive digital human models remove guesswork and plugs into proven real-world human physical factors for a range of users. 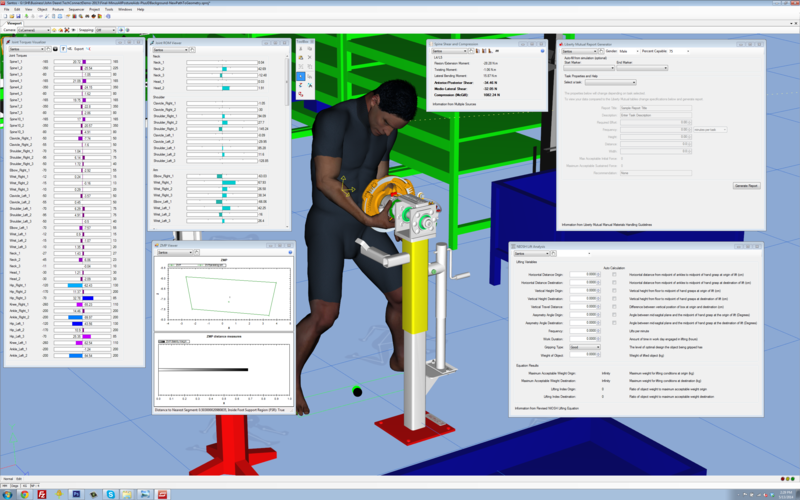 We can predict workers’ ability to complete their tasks because strength, stamina, flexibility, balance, grasp, the need to see and more are all included in our predictive human models to help your team optimize manufacturing processes and reduce your workers’ exposure to risk of injury. Predicting physical human behavior has never been more flexible and authentic. Please contact us when you’re ready to enable your team to obtain the human-centric trade-off analysis data they need to inform and support their industrial design decisions.